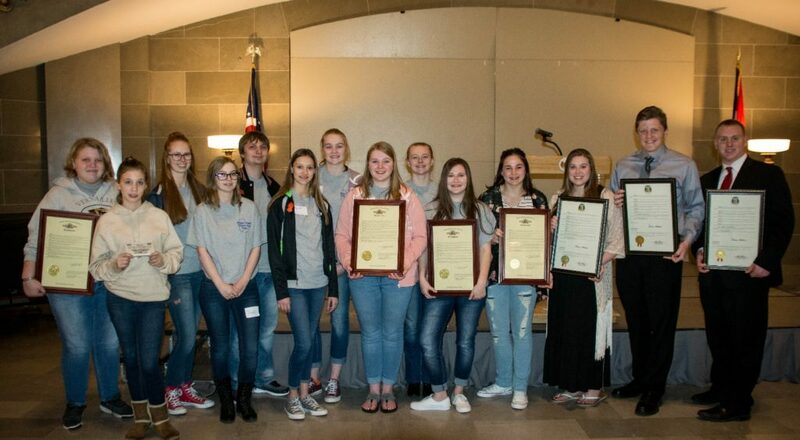 ACT Missouri proudly announces our 2018 Outstanding Youth Prevention Award Recipients! Paige Anderson and Jennifer Hassler, from the Council for Drug Free Youth Coalition received the award for their exemplary involvement and service in prevention. Paige is a student at Calvary Lutheran High School where she serves as the school’s SADD Secretary and assisted with Safe and Sober, It Only Takes One, Red Ribbon Week, and Suicide Prevention week. She is a member of the Inklings Writing Club, Key Club, Future Teachers of America, LOGOS, GPSFLife, and FFA. She lettered in Drama Productions and received the Earth Science and Ag Science Award. Jennifer is a student at Helias Catholic High School where she is an active member and President of 4-H, the varsity archery team, head sports photographer, wrestling cheerleader, and Editor in Chief of the school’s newspaper. She is a Kids for Wish Kids member and has granted the wish of a sick child by raising $5,000. She is often seen distributing food at the local mobile food pantry and serving meals at Trinity Lutheran church. Jennifer is also an active member of the group supporting Operation Bugle Boy and our veterans. Both students received a Senate Resolution from Senator Kehoe in his office. Two of the winners are members of the Jefferson County Drug Prevention Coalition. Shelby Coleman, from Fox High School, is active in the Jefferson County Teen Advisory Board (TAB), Honor Integrity Inclusion and Pride (HIIP), DECA, and National Honor Society. She won the Mental Health Advocates’ Leadership Excellence Award at Missouri DECA State Career Development Conference. She aspires to be the best person she can be, chooses a drug-free lifestyle, and is an excellent student and role model. Brittany Dake is active in the Jefferson County Teen Advisory Board, Windsor SADD, and Girl Scouts. She has attended Speak Hard, Teen Institute and was an intern at NCADA’s Prevention Leadership Conference. She is a CADCA certified trainer for Scholastic’s Over-the-Counter Medicine Safety Program. She volunteered with the Youth Cardboard Box Challenge other various work with her school, extra-curricular activities, and church. Both students were presented Senate Courtesy Resolutions from Senator Wieland in his office. Winners from the Morgan County CLEAR Coalition were Anna Knoerle and Grace Unger. 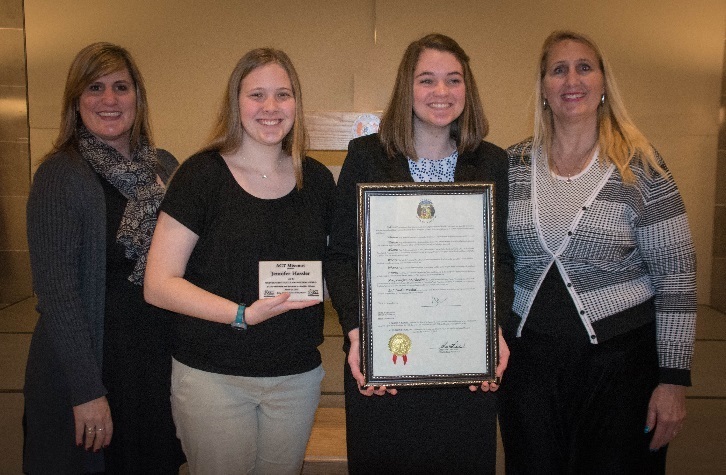 Anna began work with Morgan County CLEAR as an eighth grader and won their contest with her poster, “Keep on Jokin, Don’t Start Smokin”; which was used throughout the county to reduce tobacco use. She is actively involved with Tobacco Free Youth and attended their Youth Summit. She delivered prevention messages to peers during National Drug and Alcohol Facts Week and Smoke-Free Indoor Air programs to middle school students, Head Start parents, and other community groups. She presented “Youth Led School/Community Health Change” at the Missouri School Consolidated Health Conference. She is a SADD Officer, member of the Chamber Choir, Distributive Education Clubs of America, Student Council, Fellowship of Christian Athletes, BETA, an A+ tutor, and her school’s softball, basketball, and track teams. Grace Unger is a member of Morgan County Tobacco Free Youth, Morgan County C.L.E.A.R, and the Taking Down Tobacco project. She serves as her school’s Basketball Manager, Softball Manager, and was honored with the Community Theater’s Student of the Month, and Tobacco Free Missouri’s Outstanding Youth Leadership Award with the group. She is a passionate advocate that works hard to get the message out about the dangers of smoking and secondhand smoke. She is an outstanding speaker and is not afraid to share her fact-cited thoughts on the subject. Her strong will and determination will certainly assist in making the community smoke-free. 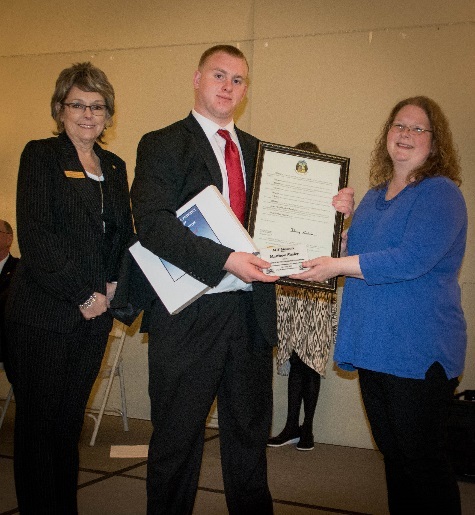 The Morgan County Tobacco Free Youth Coalition also received the award for their extraneous efforts to pass clean indoor air policies. Morgan County Tobacco Free Youth have been working for four years to educate about the risks of tobacco use and secondhand smoke and enact policy changes by: collecting signatures of support, distributing information, creating PSAs and posters, presenting to city council and mayors, collecting tobacco trash to demonstrate the scope of the problem, and conducting surveys. Several members developed and presented a session at the Annual Coordinated School Health Conference entitled, “Youth Lead School/Community Health Change”. 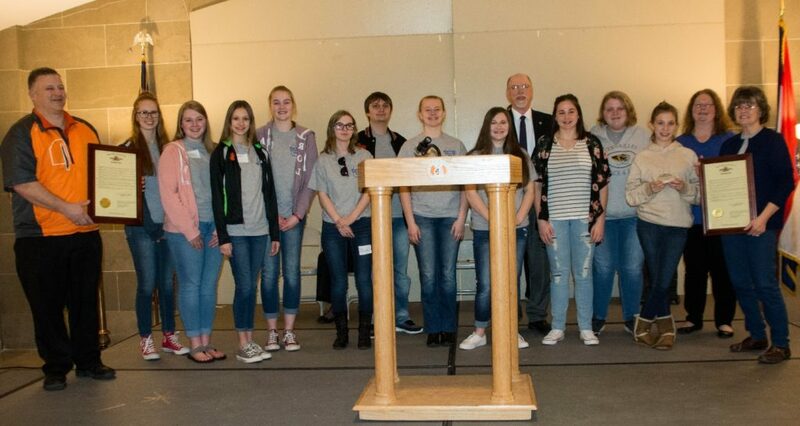 Representative David Wood attended the ceremony and provided House Courtesy Resolutions to Stover and Versailles High Schools for their smoke-free advocacy. Five members of the Youth with Vision Coalition in North Kansas City were recipients of this prestigious award. Several received Courtesy Senate Resolutions from Senator Denny Hoskins, and Representative McGaugh presented her constituents with an official Missouri State Flag that had been flown over our Capitol. 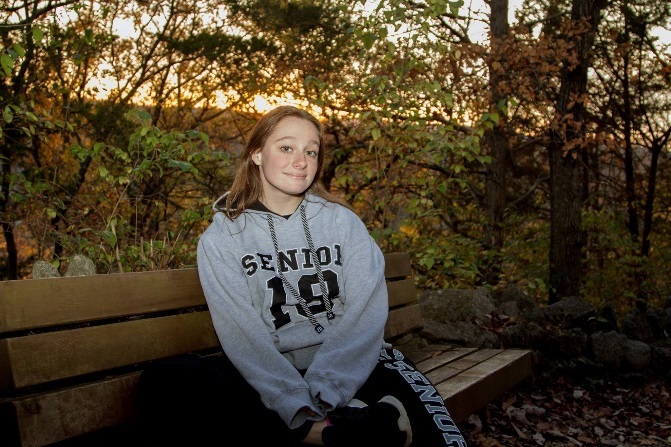 Caitlyn Bohanan is the founder of her school’s Hornet Pride; a mentor/trading card program that connects high school students with middle elementary students to talk with them about good choices and staying drug free. She advocated with area Senators and Representatives about the effects and dangers of tobacco, prescription drugs, and the legalization of marijuana. She volunteered her time to perform retailer compliance checks and produced public service announcements. She is a volunteer coach for the Northland Chiefs Cheerleading Association, Synergy Domestic Violence Center, Gladstone Theater in the Park, and academic tutor for middle school and elementary students. She received the first youth “Leadership in Prevention” award at the annual Northland Prevention Conference and was selected for Fox 4’s “Reaching for Excellence” Young Achievers Feature. Representative Noel Shull provided House Courtesy Resolution in her honor. Adones Eskew is also involved with Lawson’s Coalition in Action (CIA) and is passionate and dedicated to his school and community’s prevention efforts. He volunteered to attend the Northland Leadership Conference, Prevention Day, and the Northland Prevention Conference. Lawson’s CIA campaign, “How Full is Your Cup?” was a tremendous success and shared at the Northland Prevention Conference for other schools and organizations to learn from. He also has earned varsity letters for athletics and academic awards. Piper Killingsworth is also an active member of Lawson’s Coalition in Action (CIA) and has been involved in her school and community’s prevention efforts. She volunteered to attend the Northland Leadership Conference, Prevention Day, and the Northland Prevention Conference. She participates in student leadership, countless clubs and school activities, and is the recipient of numerous academic and leadership awards; including college scholarships. Jace Robinson has been a committed member and leader of Youth with Vision (YWV) for the past four years; currently serving as its Education Chair. He has also been a vocal advocate at the annual Prevention Day and other local events, speaking with state legislators on issues that impact youth. He has also worked on a variety of educational campaigns and PSAs, spreading the prevention message in the three-county area. He assists with YWV’s two annual fundraisers: Mud Mania and Bunco Mania. He is on the Varsity Soccer and Track teams and plays on a competitive club soccer team. His involvement in church includes serving as a Vacation Bible School helper, and he participated in the Missouri Chamber of Commerce Leadership in Practice Program. Matthew Shafer joined YWV more than a year ago and attends monthly meetings and events. He attended Prevention Day at the Capitol and was a lead speaker; sharing our legislative priorities with our Representatives and Senators. He also volunteered his time and worked with his school to obtain permission to attend the Northland Prevention Conference in March 2018. Matthew is very active in his church and spends endless hours in volunteer and community service. He successfully completed and is certified as a paramedic and EMT as a senior in high school.